Is there Work in Social Networking? Was news to me, but Google now has a blog about mobile matters. The latest entry covers an interesting new item: New magical blue circle on your map. Note the mention that GPS will drain your mobile battery quickly. This method is far less accurate than GPS. If you do have a GPS-enabled device, My Location can actually complement it. My Location kicks in faster than GPS in most cases, so you can access your location even faster on the map. It also works reliably indoors (unlike GPS) and doesn't drain your phone battery at the rate that GPS does.... "
In HBS Working Knowledge: Best Practices of Global Innovators. Mostly about externalizing and collaborating for better innovation. Took a look at P&G Productions Petside site, Recently announced. Included are dog and cat blogs, with lots of non professional photos. Nice idea for pet lovers. Looks like this site was set up so as to be crawlable and searchable. Only initial criticism is that each of the blogs has been set to have very long lists of iniital posts shown, and since there are so many pictures, this could be a problem for non-broadband users. Fron Ecommerce Times, I certainly do believe this. There is also an increasing tendency to make these connections mobile. Eighty-two percent of 16-to-24-year olds in Europe prefer to go online than watch television, according to a European Interactive Advertising Association survey, which also revealed that about six out of 10 West Europeans go online regularly. More than 80 percent of those polled said they "couldn't live" without at least one Internet ... "
See a new word? Created a new word? Consider the Merriam-Webster Open Dictionary. Also discussed here in the Britannica Blog. 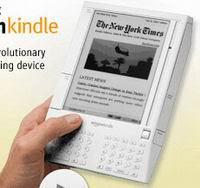 Amazon has released an Ebook reader called the Kindle. Here is it's site with videos and lots of commentary. Contrary to most other implementations of eBooks, it can download books wirelessly without the need for an intermediate computer. The Kindle costs about $399 (high) and Amazon will offer many best-sellers for $9.99, less on a monthly basis. It will also offer subscriptions to magazines such as the WSJ and NYT. Sounds good, have not tried one as yet to check problems like readability and ease of use. Based on the picture it looks big and primitively designed. Ugly. No iPod stylishness here. Borders is promoting a Sony reader. This whole idea of eBooks has not taken off, and it needs that to make more content available. I have tested two so far, and none was really satisfactory. Will try to get a demo of this one. Plain black print on a white page is still more restful for the eyes. Update: As can be expected, there are lots of other intriguing details at Engadget, here and elsewhere. Dan Dodge at Microsoft has an external blog called On the Next Big Thing, which I have on my feed. He covers some interesting communications and tech issues. Most interesting of late: MacroMyopia overestimating the short term and underestimating the long term. Some useful, perhaps curmudgeonly comments about the unlikelihood of social technology replacing e-mail any time soon. Good read. We will be doing things that look much like e-mail for a long time. From Computerworld: Does Corporate Blogging Work? Case Studies. The SAS newsletter often includes some good starting points for data mining. This month they look at three approaches: Analyzing data directly from databases, spatial data analysis, and novel ways to visualize data. As you might expect these methods may be demonstrated using SAS tools, but it's still thought provoking. Also, look at the recently announced strategic partnership between SAS and Teradata. Teradata is used by most retailers and many ecommerce companies. Good, detailed article: Product Experience Drives Performance In Adweek. Covers our investments and priorities in design. Dana Boyd of Berkeley reports on the first issue of the Journal for Computer Mediated Communication (JCMC) that is devoted to social networks. Sponsored by Indiana University. Academic flavor, but some interesting pieces. Here are the eight biggest drawbacks to working from home -- even if you do get to stay in your pajamas ..."
I have done quite a bit of this lately. The article mentions many of the fairly obvious problems involved, but on balance it saves gas and works quite well. We exist now in a high-speed, broad band world. The kids are now out of the house. I can do several things at once. I have very powerful computing at hand. Works well. Reading Desmond Morris's autobiographical book: Watching: Encounters with Humans and other Animals. Back in 1969 I was reading his 'The Naked Ape' about the very broad variety of human behavior. I had also been reading Konrad Lorenz and Niko Tinbergen at the time. One riff certainly influenced the other, I was much impressed by the Naked Ape, a best seller at the time. Made me look at animals and humans in a very different way. Even made me think, briefly, of studying in this field. I have not read any of his half dozen interim books but chanced on this one at the library. Although I read many bios, I was not quite ready to read this 600 plus page biography. It started slow. Much to my surprise I found this very enjoyable and often funny. His description of a trip through France with a number of eminent biologists, including co-Nobelists Lorenz and Frish is very funny. Later he describes the animal behavior encounters he had with his live Zoo show in Britain in the late 50s, which made him a celebrity of the time. Still reading, and will likely finish, recommended if you have interest in the subject. 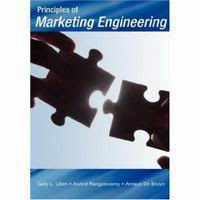 As part of a practice of applied marketing meeting at Wharton I received a copy of the new book: Principles of Marketing Engineering, by Gary L. Lilien et al. Marketing engineering? Could there be such a thing? At least it's not marketing physics. First I admit though I have taken many engineering and physics courses I have never taken a marketing course. I have learned a bit of the quantitative aspects of the field over the years here. I had a chance to read and overview a good portion of this book, and to my surprise it does a good job of positioning marketing as quantitative engineering in a meager 192 pages. Each topic: response models, market share, customer value, segmentation, perceptual maps, forecasting, conjoint, new product development, marketing mix and promotions are carefully positioned with only a minimum number of equations and some real-world examples. Surprising, too is that this book is readable, I managed a third of it on a long flight. I don't think it can be complete given its size, but it positions a lot of fairly new techniques well. I would like to go through this book with a knowledgeable P&G person to see if, and how we use each technique, and have altered it to our own requirements. Much recommended for someone who wants a readable introduction to modern quantitative marketing methods. Even the analysis of Web 2.0 topics like blogs are mentioned, and the use of advanced simulation techniques to iteratively test proposed solutions. The primary author Gary Lilien of Penn State, is one of the well-known deans of marketing science. He has a consultancy (who doesn't) called DecisonPro. They sell a number of marketing analysis frameworks that work in Excel, free for evaluation, have not tried any of them. Poll finds nearly 80 percent of U.S. adults go online. Tom Davenport writes in HBR Online that he is skeptical about the business value of social networks. The comments section contains some useful debate on the subject. Just heard of the Chumby device. Its a small wirelessly networked always-on linux computer that can run widgets and flash applications. Not a mobile computer, needs to be plugged in. Costs about $180. Sort of a smart, networked, extensible alarm clock. There are lots of widgets written for it already, for example some are essentially RSS feeds. One is a Facebook status display, etc. Could some sponsored applications, like pharma reminder and re-order systems be written for it? Here is a review in Interactive Design, which points out that its hard to get new home appliances accepted. I like the idea of mutiple simple display devices linking to the home wireless network.